Through the everlasting repeating pattern of the interlocking vines, our creative team have delivered a modern perspective on our iconic Tree of Life® filigree design. The Tree of Life® Origin collection captures where we have come from and our hopes and dreams for what the future may hold. 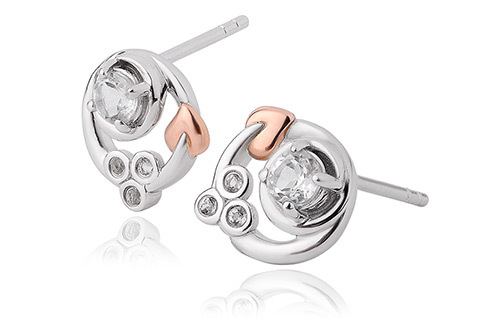 These wonderfully unique silver and rose gold earrings feature circular flowing vines and are set with 4 beautiful white topaz. Containing rare Welsh gold, the Gold of Royalty for over 100 years, the Tree of Life® Origin earrings have a matching pendant and ring in this collection.